If the Father begat the Son, he that was begotten had a beginning of existence: and from this it is evident, that there was a time when the Son was not. 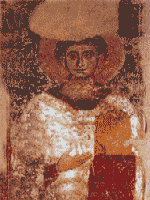 Arius (AD ca. 250 or 256 – 336) was a Christian priest from Alexandria, Egypt in the early fourth century whose teachings were deemed heretical because of his non-Trinitarian view. Arius began to say things like this in his sermons and writings: "If God and Christ were equal then Christ should be called God’s brother, not God’s Son." People puzzled about that. They were hearing now something different from this presbyter than they were hearing from the bishop. And Arius also created the very famous saying, "There was a time when He was not." "There was a time when the Son did not exist." So in his view, Christ became what we could call a third thing. He is neither God nor is He man, but something in between. There is God and there is the Son and there is the rest of creation. So rather than having two things you have a tertium quid, a third thing — neither god nor man. This page was last edited on 28 December 2018, at 14:50.